Custom tailgates ... click here for pictures, applications and pricing! If your tailgate is rusted beyond repair or destroyed in a fender bender on the freeway and you now find yourself in need of a replacement or you just want a new custom tailgate, then you have come to the right place. A custom tailgate is a great alternative to expensive Ford tailgates or Chevy and Dodge tailgates at the parts department of a dealership. Our tailgates are a great quality tailgate, and they also look sweet. Fifth wheel tailgates are very popular these days with all the RVers. They have a V type of cut out that lets you keep your gate up while you hook up. Louvered tailgates by Handy come in a fifth wheel version and the straight version. Rugged construction that enhances the appearance of your pickup. The Handy Louvered Tailgates are the only true "form fit" tailgates. These quality replacement tailgates fit Chevy/GMC, Dodge and Ford full size pickups. All models provide exceptional rear view visibility and the deep "V" allows for easier hitching for 5th wheel trailers. Attractive black powder coated finish (suitable for your own paint job). Easy installation. Handy also builds a solid custom tailgate that's much easy on the pocketbook. Their econo-gate series give you the most visibility when hooking up or backing up. Suitable for fifth wheel applications the econo-gate makes the perfect "2nd tailgate" for when you travel. You can find them for about $200. You will experience amazingly improved gas mileage with an econo-gate as well as most other tailgates that allow the air to pass through. An open bed with a factory gate is like dragging a parachute behind you. It robs your truck of great fuel economy. The only real test I'm aware of was a Popular Mechanics article years ago where they improved the mileage by 9% by installing a tonno cover on the truck that eliminated the majority of drag. This is possible with any of these after market products. You may not want something that is quite so heavy. Husky makes a custom tailgate you might be interested in. It is finished in bright-dipped anodized aluminum for light weight, and it won't rust or corrode if scratched. It is available in 5th wheel style only. Custom shaped to fit the pickup and the louver design reduces wind resistance. Uses existing factory hinge and latch points and has easy on - easy off mounting. Its like a factory tailgate on new truck models. The new 5th wheel style center opening latch opens just like the factory and includes a lock and key set on new truck models. New OEM style rotary latches and center opening handle for easier opening and closing on new truck models. 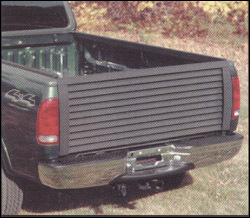 But if you want to add a sweet new custom look to your truck, then custom tailgates are for you.